DariFree™ - the best choice for a non-dairy milk substitute. Physicians, Nutritionists and the Authors of dozens of books and hundreds of recipes written for the GFCF community recommend DariFree™ as the best choice for a non-dairy milk substitute. “DariFree, which is made from potatoes and is, I think, the best tasting milk substitute” - Andrew Weil M.D. Lisa Lewis, Ph.D, identifies DariFree™ as the preferred milk alternative in the book Special Diets for Special Kids. DariFree™ is an Allergen-free plant based Veggie Milk made from all natural non-GMO potatoes and widely used by people with food intolerances including children with Autism, Asthma, MSUD, Galactosemia and PKU. DariFree™ has less then 2g of sugar per serving, contains as much calcium as milk, is vitamin enriched, great for drinking, as a creamer, with cereal, cooking, and baking and can be enjoyed by almost anyone seeking optimum nutrition in their pursuit of better health and a more sensible way of living. DariFree™ - the Only Choice for an Allergen-free milk substitute. Food allergies/intolerances are caused by proteins and DariFree™ is Protein Free! DariFree™ is the ONLY Allergen-Free Milk Alternative specifically developed for the many individuals on a protein restricted/allergen-free diet and can be used as an Allergen-free dairy substitute by most people who have special dietary needs. DariFree™ is free of Eggs, Wheat/Gluten, Milk/Lactose/Galactose/Casein, Glucose/Stevia, NUTS/PEA/SOY/TOFU, RICE, Protein, Fat/Cholesterol, Gums, Fiber, Preservatives, MSG and mono-diglycerides. From entrées to deserts, you can substitute DariFree™ for Milk (powdered or liquid) in almost all recipes. DariFree™ can have the consistency of 1% milk when mixed or add extra DariFree™ powder (no additional water/liquid) to make a more creamy consistency. Once mixed, DariFree™ will remain fresh at least a week with refrigeration. DariFree™ is not only cholesterol and lactose-free, it is also free of soy, rice, oils and gluten, and yet contains as much calcium as milk. DariFree™ contains no MSG and is a good source of vitamins. Use DariFree™ on cereal, for drinking, cooking, baking and as a coffee creamer. Best of all, children love the delicious creamy taste. DariFree™ is widely used by people with food intolerances including children with autism. To ensure safety, consistency and quality, DariFree™ is only produced and packaged at GMP certified facilities. DariFree™ is an Allergen-free plant based Veggie Milk made from all natural non-GMO potatoes and widely used by people with food intolerances including children with Autism, Asthma, MSUD and PKU. Food allergies/intolerances are caused by proteins and DariFree is Protein free! DariFree was specifically developed from potatoes for the many individuals on a protein-restricted diet and can be enjoyed by most people who have special dietary needs. DariFree™ is widely used by people with food intolerances including children with autism and PKU. Best of all, children love smooth creamy DariFree. Lisa Lewis, Ph.D, identifies DariFree as the preferred milk alternative in the book Special Diets for Special Kids. DariFree contains as much calcium as milk, is vitamin enriched, great for drinking, with cereal, cooking, and baking and can be enjoyed by almost anyone seeking optimum nutrition in their pursuit of better health and a more sensible way of living. DariFree is free of gums, eggs, nuts, gluten/lactose, casein, protein, soy/peas/tofu, rice, fat/cholesterol, preservatives, MSG and mono-diglycerides and can be enjoyed by most people who have special dietary needs. 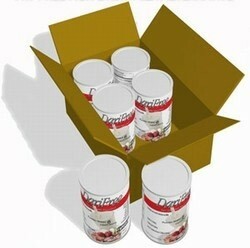 DariFree ™ Cans are self stable and is an excellent food storage treat. DariFree™ is only produced and packaged at GMP certified facilities.